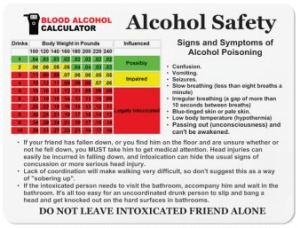 GET AN ALCOHOL SAFETY MAGNET FOR YOUR REFRIGERATOR THAT FEATURES OUR BAC CHART, SIGNS AND SYMPTOMS OF ALCOHOL OVERDOSE AND HOW TO TAKE CARE OF A DRUNK FRIEND. CLICK HERE TO ORDER. The definition of blood alcohol content is the concentration of alcohol in one’s bloodstream, expressed as a percentage. Blood alcohol content, or BAC, is used to determine whether a person is legally intoxicated, especially under a driving while intoxicated law. In the field of traffic safety, BAC is expressed as the percentage of alcohol in deciliters of blood–for example, 0.10 percent. A 160-pound man, for instance, will have a BAC of approximately 0.04 percent 1 hour after consuming two 12-ounce beers or two other standard drinks on an empty stomach. All State Laws have specific driver BAC limits, which vary by State. According to these laws, operating a vehicle while having a BAC over the given limit is illegal.